Chrome OS To Have It's Own Media Player - Watch Out Windows! Chrome OS To Have It’s Own Media Player – Watch Out Windows! 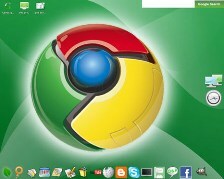 One thing’s for sure – and that is Google is soon going to release the Chrome OS (operating system). The Chrome OS will not only rival Microsoft’s flagship Windows operating system, but Chrome OS will be designed to get you straight to the web – and get there fast!